GDP data from Canada and the US, US Durable Goods Orders, New Home Sales, Unemployment claims, Haruhiko Kuroda’s speech are the major topics in Forex calendar. heck out these events on our weekly outlook. Last week, Federal Reserve Chair Janet Yellen switched the phrase “considerable time” with the word “patience” in referral to rate hikes, at the FOMC press conference. The move was made to calm markets awaiting sharp policy shifts. Three Fed officials registered their dissent expressing discomfort with the Fed’s message. The Jobless claims came out better than expected with a drop to 289K, reaffirming US labor market’s strength. Philly Fed Manufacturing index came below expectations reaching 24.5 following the steep rise in November, still maintaining a positive score. New orders plunged from 35.7 to 15.7 and employment down from 22.4 to 7.2 points. Will the US economy continue to strengthen in 2015? Canadian GDP: Tuesday, 13:30. Canada’s economy expanded 0.4% in October after higher oil, gas and mining extraction, as well as manufacturing boosted growth. October’s reading was preceded by a 0.1% contraction in August. Since Canada is a major oil exporter, the Bank of Canada estimates that the slide in oil prices will reduce Canadian economic growth by 1/3 percentage points, somewhere between 2% and 2.5% in 2015. Poloz is also worried by household imbalances risking financial stability, leaving the door open for additional guidance in the future. Markets expect Canadian GDP to rise 0.1% in November. US Durable Goods Orders: Tuesday, 13:30. U.S. durable goods orders picked up in October beating expectations for a 0.4% fall. New orders rose by 0.4%, reaching $243.8 billion. Meanwhile, demand for manufactured goods, excluding transportation dropped 0.9% to $167.6 billion in October, after a 0.1% rise in the prior month. Analysts believe the decline suggests that business capital spending is weakening in Q4.The Fed expects GDP to slow to 2.5% in the fourth quarter. Long lasting product orders are expected to surge by 3%. While core orders are predicted to 3edge up 1.1%. US GDP: Tuesday, 13:30. On The second estimate of real gross domestic product for the third quarter of 2014 showed an annual rate increase of 3.9%, weaker than the 4.6% gain posted in the second quarter. However, this forecast was upwardly revised from the advance estimate of 3.5% released in October. Personal consumption expenditures and nonresidential fixed income investment increased more than expected, but export growth was slower than previously thought. The final GDP release for the third quarter is expected to reach 4.3%. New Home Sales: Tuesday, 15:00. Sales of new U.S. homes rose modestly in October, following a pickup in activity in the Midwest. New home sales increased 0.7% to a seasonally adjusted annual rate of 458,000. Economists expected a higher figure of 471,000. Sales of existing homes rose 1.5% in October to a seasonally adjusted annual rate of 5.26 million, adding another positive sign that the housing market is recovering. Analysts exdpect new home sales to reach 461,000 in November. US Unemployment Claims: Wednesday, 13:30. Fewer Americans filed claims for unemployment benefits last week, indicating increasing confidence among employers. The weekly unemployment claims dropped 6,000 to a seasonally adjusted 289,000, the lowest level since late October. The four-week average dropped 750 to 298,750. In the first 11 months of this year, employers have added 2.65 million jobs, posting the best hiring since 1999. The number of new claims is expected to reach 291,000 this week. Haruhiko Kuroda speaks: Thursday, 3:45. BOE Governor Haruhiko Kuroda speaks in Tokyo. Bank of Japan Governor Haruhiko Kuroda stated the bank will meet its 2% inflation target and continue to increasing base money, or cash and deposits at the bank, at an annual pace of 80 trillion yen ($674 billion). 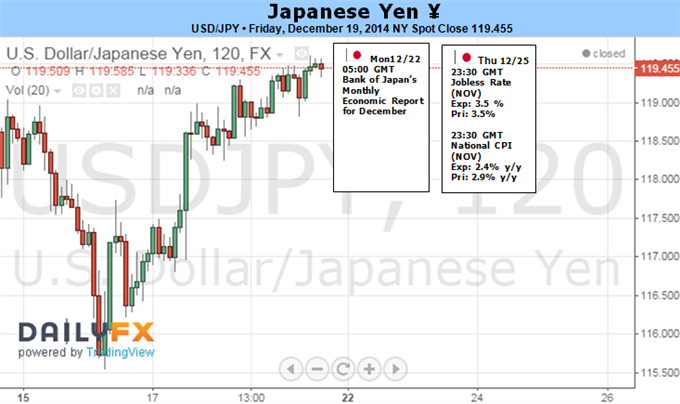 Kuroda said Japan’s economy continues to recover moderately after the tax hike effect subsides. 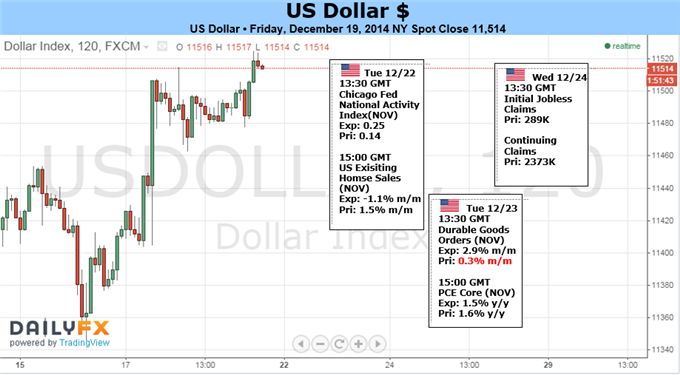 US Dollar Targets Fresh Highs versus Euro, but What Could Change? The US Dollar finished at fresh multi-year highs versus the Euro and near key peaks versus other currencies, boosted by a sharp improvement in US interest rate expectations on a highly-anticipated Fed interest rate decision. We expectsignificantly less volatility in the holiday-shortened week ahead, but traders should be wary of any surprises from revisions to the Q3 US Gross Domestic Product report, US Durable Goods Orders data, and two Home Sales releases. Although admittedly unlikely, any surprises in the third revision to Q3 GDP figures could have a marked effect on US interest rates and the Dollar itself. The US Dollar jumped alongside short-term yields on this past week’s highly-anticipated US Federal Open Market Committee interest rate decision. Fed officials initially disappointed those who expected a more hawkish shift in policy in the first FOMC meeting since the end of Quantitative Easing in October. Yet short-term treasury yields and implied US interest rates rose sharply as Fed Chair Janet Yellen essentially said that rate hikes could come after as few as two meetings. The US Dollar continues to track changes in the US 2-year Treasury Yield—a strong proxy for Fed interest rate expectations—with great accuracy. A sharp reversal leaves the 2-year UST yield at more than twice the low it set through October 15—the exact day of the US Dollar low as seen through the Dow Jones FXCM Dollar Index (ticker: USDOLLAR). Since that date, the Greenback has surged a remarkable 11 percent versus the interest-rate sensitive Japanese Yen, 7 percent versus the Australian Dollar, and 5 percent versus the Euro. US Dollar traders will almost certainly track changes in yields and interest rate expectations, and a key question is whether domestic economic data can continue to impress and send rates and the USD to further peaks. Dollar momentum seems stretched, and economic data can only surpass expectations for so long. Yet the US Dollar remains in an uptrend until it isn’t, and we’ll need to see concrete signs of a turn to call for a meaningful turnaround. Traders should otherwise keep an eye on developments in the Russian financial crisis and broader Emerging Markets. Many were surprised to see the US S&P 500 track the USD/Ruble exchange rate on a virtual tick-for-tick basis, but the truth is that further destabilization in Russia threatens contagion and carries direct implications for global financial markets. Contagion risks sent the S&P 500 sharply lower and the flight to safety likewise pushed the US Dollar down versus the Euro and Yen as traders excited USD-long positions in a hurry. Both the Greenback and the S&P recovered sharply into the end of the trading week. Whether or not the Dollar continues higher may subsequently depend on the trajectory of the Ruble and broader financial market risk sentiment. The outcome of Japan’s snap election passed without making much noise in the financial markets last week as expected. The LDP sailed to an easy victory and secured the super-majority it needed to ensure the continuity of “Abenomics”, at least through the near to medium term. With the last Bank of Japan policy meeting of the year also behind them, investors have been left with external forces as the foremost driver of Japanese Yen price action. Seasonal capital flows stand out as the most potent potential driver on this front and may drive the unit higher in the final weeks of 2014. Swelling risk appetite – embodied by a relentless push upward by US share prices – was a defining feature of the macro landscape over the past year. This seemed to reflect a response to Fed monetary policy: the steady QE tapering process defined a clear window in which policymakers would not withdraw stimulus. The landscape probably won’t look as rosy in 2015. While the precise timing of liftoff for the Fed policy rate is a matter of debate, the commencement of stimulus withdrawal at some point in the year ahead seems to be a given. The prospect of higher borrowing costs may fuel liquidation of exposure reliant on cheap QE-based funding as market participants lock in year-end performance ahead of tougher times ahead. For currency markets, such a scenario may take the form of an exodus from carry trades, which are usually funded in terms of the perennially low-yielding Japanese unit. That would imply a wave of covering on short-Yen positions, pushing prices higher. 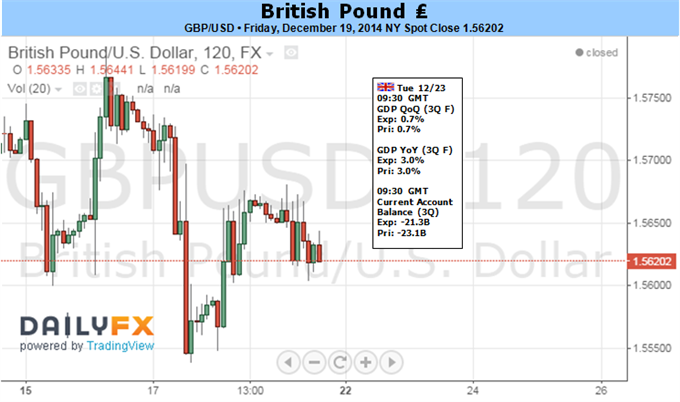 The British Pound traded higher versus all G10 counterparts save the US Dollar and Japanese Yen. Why might it continue higher through the foreseeable future? There’s relatively little in the way of foreseeable economic event risk out of the UK next week, and that may in fact play in the domestic currency’s favor. It was only two weeks ago when GBP/USD volatility prices traded to multi-year peaks, and a negative correlation between vols and the GBP helped explain why it fell sharply on clear uncertainty. Yet in a remarkable shift in sentiment, the Sterling now boasts the lowest volatility prices of any G10 currency. If correlations hold firm, this may be enough of a reason for continued appreciation. A key exception comes from final revisions to Q2 Gross Domestic Product growth numbers due Tuesday, but surprises are relatively unlikely and only a big miss would force important GBP volatility. Beyond that, traders will keep an eye on the usual slew of early-month US economic event risk—especially the end-of-week US Nonfarm Payrolls report. With the Scottish Independence Referendum now past, the UK currency can return to basics and trade off of traditional fundamental factors. Credit Suisse Overnight Index Swaps show that the Bank of England will raise benchmark interest rates by approximately 0.50 percentage points in the coming 12 months. This may not seem like much, but it is only second to the US Federal Reserve (and US Dollar) at +0.58%. The clear divergence in growth and yield expectations between the UK and other major economies leaves the GBP in the position of strength. And though an obvious US Dollar uptrend makes us reluctant to buy into GBPUSD weakness, we believe the UK currency could trade higher through the coming week and perhaps month. The Nikkei as you can see initially fell during the week but found enough support below the ¥17,000 level to turn things back around and send the market higher. With that, we feel that this market will eventually hit the ¥18,000 level, and then probably higher than that given enough time. We have a longer-term target of ¥20,000 going forward, and we do think that it will eventually be hit. We have no interest whatsoever in selling this market, as it seems to be so well supported below and the fact that the Bank of Japan continues to have ultra-easy monetary policy. The DAX fell down to the €9200 level, but as you can see found enough support below in order to push the market higher. We ended up testing the €9900 level but pulled back slightly from there in order to form a hammer. We need to break above the €10,100 level to get a longer-term buy-and-hold type of signal, and we do think that it’s coming sooner or later. With that, we are bullish but we recognize that we need a little bit of work to be done first before putting any money into this marketplace. The NASDAQ fell during most of the week, but found enough support just below the 4600 level to bounce significantly and form a reasonably attractive looking hammer. If we can get above the 4800 level, we feel the NASDAQ will then be cleared to go to the 5000 level given enough time. We feel the pullbacks continue to be buying opportunities but recognize that with Christmas coming this week, we don’t necessarily expect to see much in the way of action. Ultimately, we think 5000 is the target longer-term and we continue to trade this market as such. The S&P 500 fell initially during the week but found enough support below the 2000 level to turn things back around and push the market towards the 2080 level. That being the case, the market is going to continue to go much higher, but we think that in the meantime we might just simply grind sideways due to the fact that the holidays are here. Ultimately, pullbacks will be buying opportunities, and we feel that this market should ultimately break out to the upside and continue its upward trajectory. Last edited by 1Finance; 12-20-2014 at 08:14 AM. The gold markets fell during the course of the week, breaking below the $1200 level. Because of this, it appears of the market is ready to go lower, perhaps heading to the 1150 or even 1140 below there. That being the case, we are still bearish of this market and we believe that the 1250 level above is in fact a massively resistive. Ultimately, the US dollar should continue to strengthen, and that should continue to put a bit of pressure on the gold markets on the whole as it works against buyers. With this being Christmas week, we don’t expect much out of this pair but we do recognize that the hammer that form for the previous week of course means that there is plenty of support. With that, we are not placing any long-term trades but we do recognize that pullback should represent value in the US dollar, giving us an opportunity to go long of a market that quite frankly should continue to go long. The meantime, we feel that selling is completely out of the question when it comes to the USD/JPY pair, and as a result we won’t.